encompass is pleased to announce that it now offers global biometric identify verification (IDV) and document authentication on its platform. encompass has integrated with global electronic identity verification providers to enable customers to fully automate IDV as part of their overall onboarding and KYC processes. Advanced imaging algorithms allow users to authenticate an official identity document and conduct biometric checks against a “selfie” of the person being onboarded, in addition to conducting bureau checks for further validation. Bureau searches are carried out globally, using a customer’s preferred sources. At encompass, our goal is to transform our customers’ KYC processes through Intelligent Process Automation and AI, and the integration of biometric identify verification into our platform is testament to our commitment to delivering cutting-edge technological solutions. Against the backdrop of an ever increasing and evolving regulatory environment, our ability to adapt our platform to incorporate technologies as and when they become available means our customers can “future proof” their compliance processes. 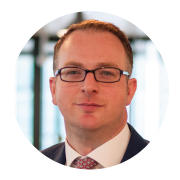 Before joining encompass in early 2016, Graeme’s career spanned multiple roles at information giant Equifax, from sales and credit risk to product management and, latterly, representing Equifax at the Business Information Providers Association.